What is the difference between the Phantom 3 Professional and the Phantom 3 Advanced? The biggest difference between the Phantom 3 Professional and the Phantom 3 Advanced is in the camera. The Phantom 3 Professional is capable of shooting spectacular 4K video at up to 30 frames per second, and the Phantom 3 Advanced is capable of shooting at resolutions up to 2.7K. Both models shoot 12 megapixel photos. The other main difference is the Intelligent Flight Battery charger. The Phantom 3 Advanced comes with a 57-watt charging unit and the Phantom 3 Professional comes with a 100-watt charger, the latter of which allows for shorter charging times. Can I charge my Remote Controller and Intelligent Flight Battery at the same time? While the Remote Controller charger and Intelligent Flight Battery charger have been integrated into one unit for your convenience, it is recommended that you only charge one item at a time. We recommend that you never charge both items using the same charger at the same time. What are the buttons on the back of my Remote Controller for? The two buttons on the back of the Remote Controller can be customized and assigned to function as you choose through the DJI GO app. Refer to the manual for more information. How far can I fly my Phantom 3? The signal transmission distance will vary depending on environmental conditions, but the Phantom 3 series can reach distances of up to 3.1 miles (5 kilometers) away from the pilot. What app should I use with my Phantom 3? The Phantom 3 is compatible with the DJI GO app for iOS and Android, which is already used with the DJI Inspire 1. The app will detect which aircraft is connected and automatically adjust accordingly. The DJI GO app is only compatible with devices running iOS 8.0 or later or Android v4.1.2 or later. Support for additional Android devices will become available as testing and development continues. How do I use the Director automatic video editor? Director is an automatic video editor built into the DJI GO app. After recording several video clips, simply tap “Director” from the app’s home screen. You can then select a template and a specified number of clips, which are automatically combined to create a short film that can be shared immediately. How do I customize the sticks on my remote controller (change the control mode) for my Phantom 3? By default, the Remote Controller is set to Mode 2. This means that the right control stick controls the movement of the aircraft and the left control stick controls the throttle and orientation of the aircraft. These controls can be changed to Mode 1 or set to a customized configuration in the DJI GO app. This is only recommended for advanced users. Can I use a Phantom 2 Remote Controller with the Phantom 3? No. The Phantom 2 Remote Controller is not compatible with the Phantom 3. The Phantom 3 uses an all new Remote Controller that operates at 2.4 GHz, has dedicated buttons for camera control, and has customizable buttons to fit your needs. Can I use a Phantom 2 Intelligent Flight Battery with the Phantom 3? No. The Phantom 3 uses a newly designed Intelligent Flight Battery with greater power. The Phantom 3 has a 4 cell battery with a capacity of 4480 mAh and a voltage of 15.2 V.
My Phantom 3 does not turn off right away, is something wrong? This is normal. After you attempt to power off the Intelligent Flight Battery, it may remain on for a few seconds as any video data is saved to the Micro SD card. This helps prevent your data from being lost or corrupted. Do I have to buy the Remote Controller separately? No, there is no need to buy a separate Remote Controller. 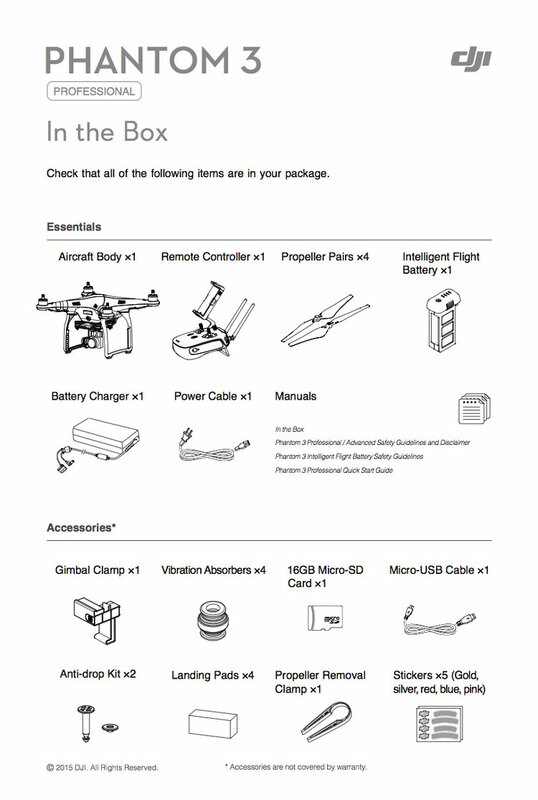 Your Phantom 3 comes with a Remote Controller that is already linked to the aircraft. Does my Phantom 3 support dual Remote Controllers? What does the “P, A, F” switch on the Remote Controller do? P-mode, or Positioning mode, indicates that both GPS and the Vision Positioning System are active and your Phantom 3 will attempt to stabilize using both. In A-mode, or Attitude mode, the aircraft does not use GPS or the Vision Positioning System. Only the barometer is used for stabilization. The aircraft can still return to the Home Point as long as a sufficient GPS signal is available. F-mode, or Function mode, activates Intelligent Orientation Control (IOC) functionality. Refer to the IOC section in the Appendix of the User Manual. By default, only P mode may be used. Refer to your user manual for instructions on unlocking the other modes. What is the Phantom 3 flight time? Flight times will vary depending on environmental conditions and usage patterns, but the Intelligent Flight Battery is designed to provide up to 23 minutes of uninterrupted flight time when fully charged. How can I restore a video file if the power is turned off during recording? Do not remove the Micro-SD card from the camera. If it has been removed, place it back in the camera. Turn the Phantom 3 on and wait approximately 30 seconds as the video file is restored. How can I ensure that my pictures and videos will be synchronized to my iOS album? You may need to adjust the settings of your mobile device. Open the Settings menu, select the Privacy tab, select the Photos tab, and then toggle the switch next to the DJI GO app icon. If the Pilot app has not been granted access to your albums, the photos and videos cannot be synchronized. Why is the discharge time of the battery not zero, even though I have never used it? Every battery is tested prior to being packaged and shipped. This affects the discharge time of a new battery and is the reason that the discharge time is not zero. The battery is safe to use. Can the mobile device holder be used on the Phantom 2 series Remote Controller?